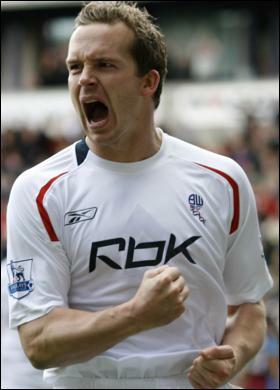 Channel 5 are all set to launch their latest assault on TV ratings with a prime-time vehicle for Bolton centre forward Kevin Davies. With footballers crossing over into mainstream television recently – with Robbie Savage on Strictly Come Dancing being a prime example – the network is desperate to tap into this area of interest and has filmed a six part series showcasing the barrel-chested frontman’s considerable physique and sharpened elbows as he fights different animals across the globe. The first hour long episode shows Davies and his crew travelling to the forests of Norway where they meet locals, partake in regional customs and then track a family of Wolverines. The final 15 minutes of the show is uncut, brutal footage of Davies pinning the father of the family to the ground and smashing its skull in with repeated elbows to the face. While the press were allowed a sneak preview of the first episode, we are promised “big surprises” for the rest of the series. It is thought that Davies does battle with rhinoceros, mountain goats, komodo dragons, bears and even Nepalese Sherpas when a hunt to find the Yeti goes awry. Davies was asked for his comments at the launch, to which he answered by destroying the table in front of him with his bare fists and screaming “KEVIN DAVIES SMASH!”.